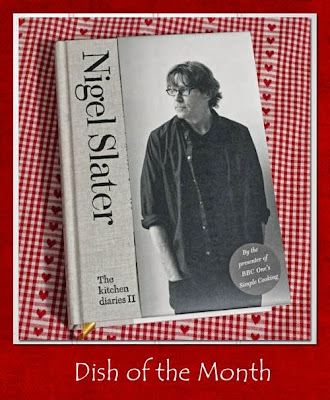 I tried to blag a copy of Nigel Slater's new cookbook "Eat - the little book of fast food" from the publishers, but sadly they did not bite. So I will have to put it on my Christmas pressie list and drop copious hints! The Kitchen Diaries II was a Christmas present from last year and here we are in October already. Most months I have managed to make my Dish of the Month before the start of the challenge but not this month, so you will have to wait for me to catch up, in the meantime, here are the rules of this little blog event. Sue, of A little bit of Heaven on a plate, and I would be delighted if you would join us. You are on fire, Dom!